Legendary off-road rider Destry Abbott (KTM) takes a break from training to grab a third in AA. 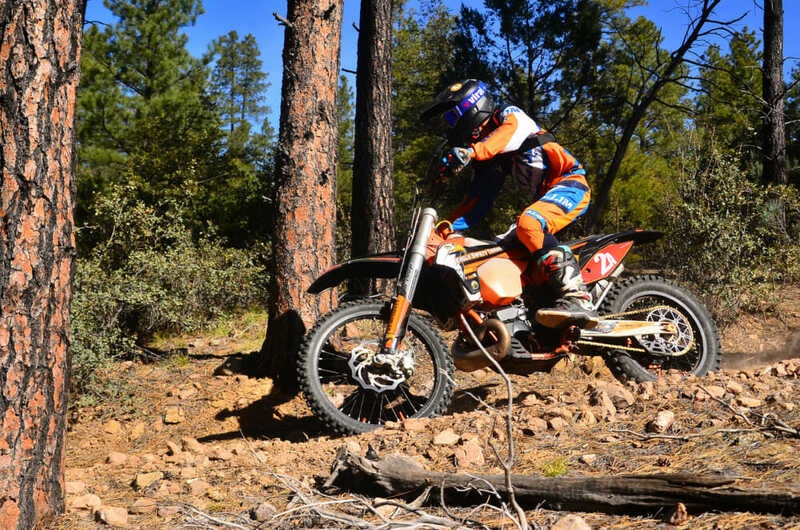 Prescott, AZ (April 7, 2019) — The round nine stop of the AMRA Arizona Offroad Championship, presented by Motocity Anthem, came to Camp Wood, north of Prescott, Arizona. 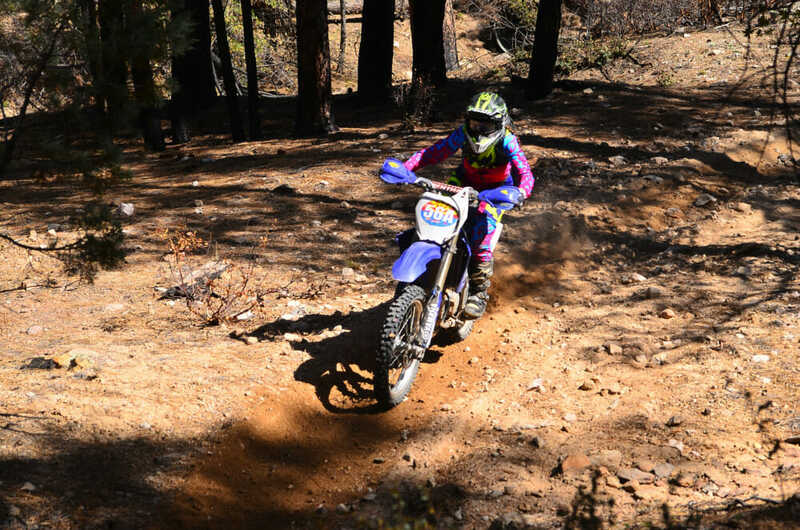 Similar to round one, which was held a few short miles away, this stop brought racers to 5000 feet and into the dense wilderness of the Prescott National Forest. 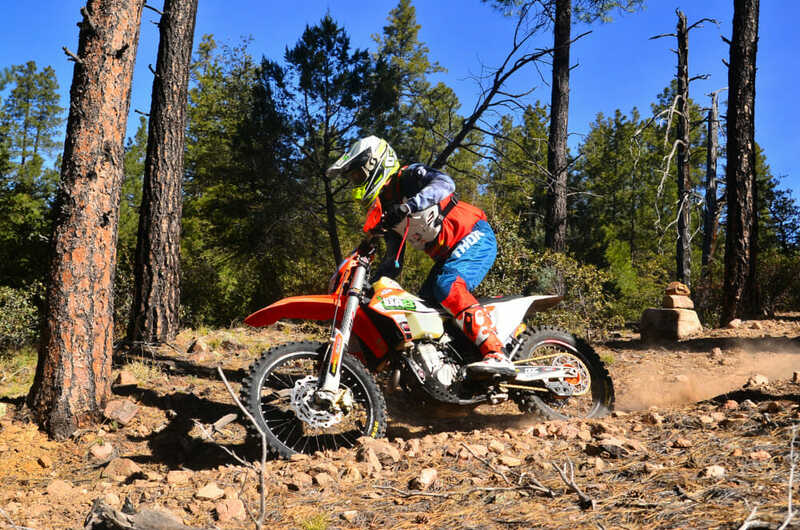 Hosted by the Arizona Trail Riders and put together by a massive volunteer effort, the race was well prepared for and the course was ready to be burnt in. A varied terrain awaited the racers, from fast flowing single track to water crossings and steep technical climbs. Without the presence of the mini riders, the race was partaken by the big bikes only. Nick Brawner (Sherco) pushes toward a second overall. 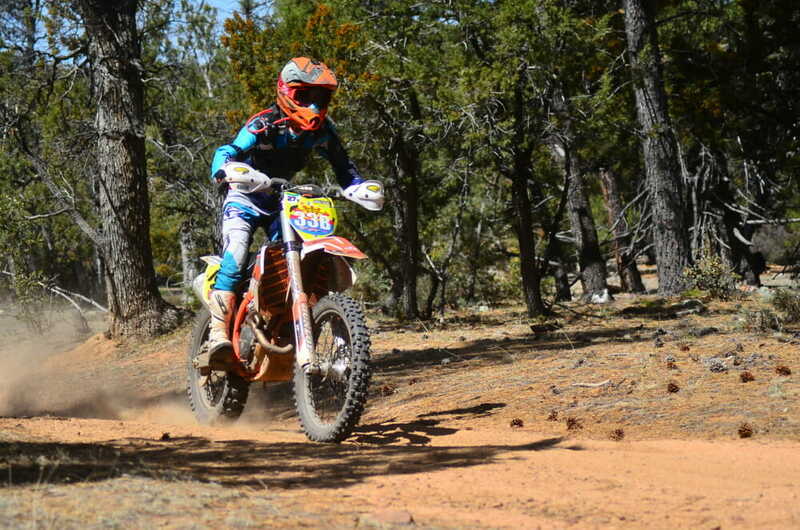 In the AA Pro class, the points leader Ryan Wells onboard his AZ DirtBike Training KTM as the one to beat. 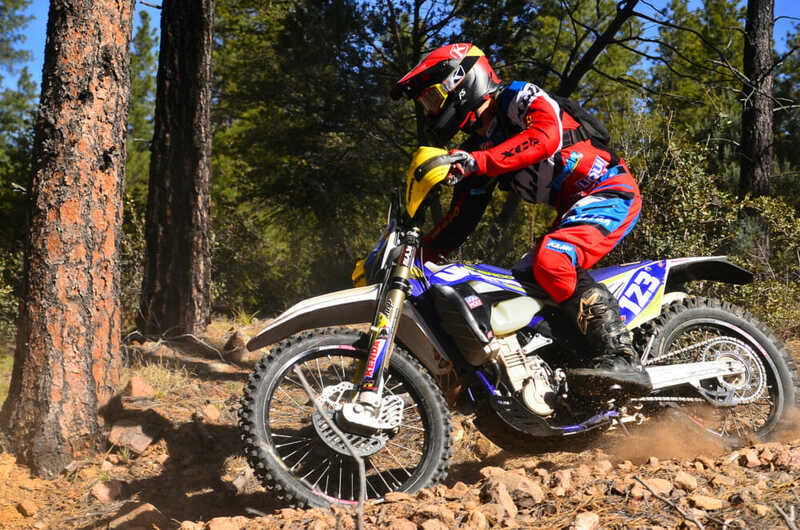 Through six tests, Wells would take the win on four of them, trading with points contender Nick Brawner and his Team Topar-backed by Hard Enduro Outfitters Sherco. Brawner would take second with a total time only 30 seconds behind Wells. Legendary off-road rider and trainer Destry Abbott would finish third onboard his DA8 Training KTM. Fourth and fifth places would go to Topar/Sherco teammate Zack Brawner and the KTM of Brent Larsen. James Flynn (GG) takes 2nd Open A and 8th overall. 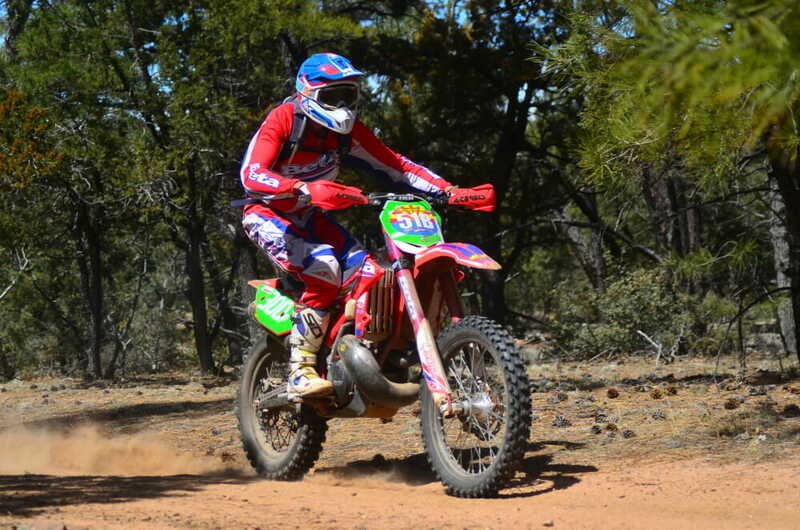 Open A went to Nick McGowan onboard a Dirtriders West Beta, also finishing fifth overall. Second place went to GasGas support rider James Flynn, followed by the KTM of Brett Bogler. Brett Dooley and Michael Peristere would go 1-2 in 250A on a Husqvarna and Yamaha, respectively. The Eagle Safety Training KTM of Kyler Heimer took the victory in 200A. Eagle Safety Training’s Kyler Heimer (KTM) takes the 200A victory. David Kertz took the 30A win on board his Beta, followed by the Kawasaki of Eric Schettler and KTM of Austin Furniss. The 40A had a KTM sweep of Steve Schaeffer, Frevent Millet and Tim Wussow. Ernie Allsup, Hans Bindels and Richard Galaska Jr rounded the top three for 50A. The Stillwell Performance Husqvarna of Nathan Berger took top honor in Open B, followed by Thomas Parrella’s KTM and Paul Rehn’s Husqvarna. KTM took two of three podium places in 250 B, with Cole Cherick taking the win, Drake Hacker’s Kawasaki taking second and Thomas Turnbull’s KTM finishing third. Christopher Markle put his Husqvarna on top of the box in 30B, with Michael King and Jonathan Buchanan’s KTMs taking second and third. Nick McGowan (Beta) takes fourth overall and first in Open A.
Steve Keller put his Yamaha on top in 40B, followed by Chris Attel’s Husqvarna and Shawn Barney’s Yamaha. Lars Briedis, David Vogt and Rory Anderson took the top three in 50B, making a Husqvarna, KTM, KTM podium. KTM swept the podium in 60B, with Mike McDaniel, Michael Powers and John Cooper. Daiana Trapp took the Women’s B in onboard her KTM, followed by Jilene Oakley on a KTM as well. Daiana Trapp (KTM) wins the Women’s B class. Red, Yellow and Green took the podium in Open C, with Kyle Ackerman taking first on a Beta, Kristopher Samford in second on a Suzuki, and Greg Samford in third on a Kawasaki. The 250C class was taken by Kaden Bedlion on KTM, followed by Ricky Evans on Yamaha and Skyler Harrington on KTM. Deegan Bauch took the 200C win on a Husqvarna, with Jacob Campbell’s Yamaha following in second and Kaelyn King’s KTM in third. Kyle Ackerman (Beta) wins the Open C class. The 30C class saw Andrew Boyd on top with his Honda, followed by Dan Mermelstein’s KTM and Charley Ivy Jr’s Honda. The 40C class had Wes Biesen taking the win with Diego Mendoza in second and Alvaro Mendoza in third, making for a GasGas, KTM, Husqvarna podium. Dan Jacobsen’s KTM won 50C, with Eric Lamca’s Yamaha in second and Eric Spector in third. Les Price, Mark Koenig and Curt Jansen took the podium in 60C, with KTM, Husqvarna, KTM. Brea Core took a dominant win in Women’s C ahead of Tracy Evans and Catalina Springstroh. Kase Anderson took the Youth C win ahead of Dominic Craighill and Ruffin Dodson, showing the Supermini’s can hang with the big boys on the challenging course. Brea Core (YAM) takes the Women’s C win in a dominant show of skill. 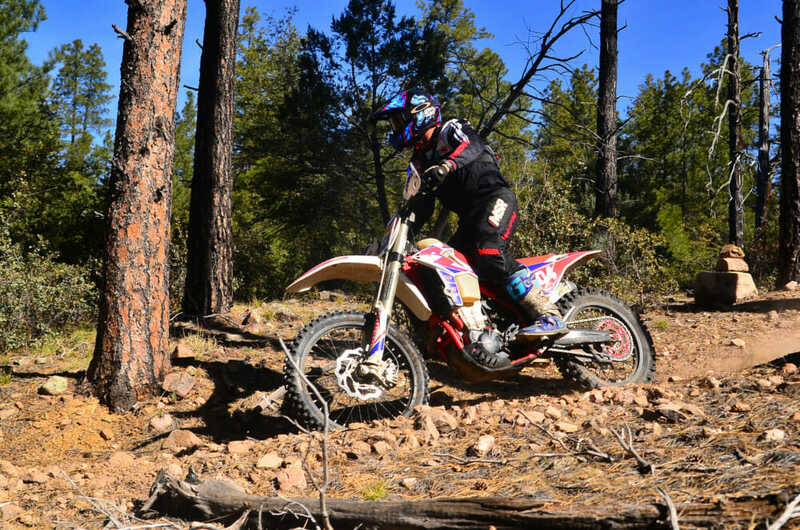 The Camp Wood Enduro proved to be a challenging course for all and saw many competitors. 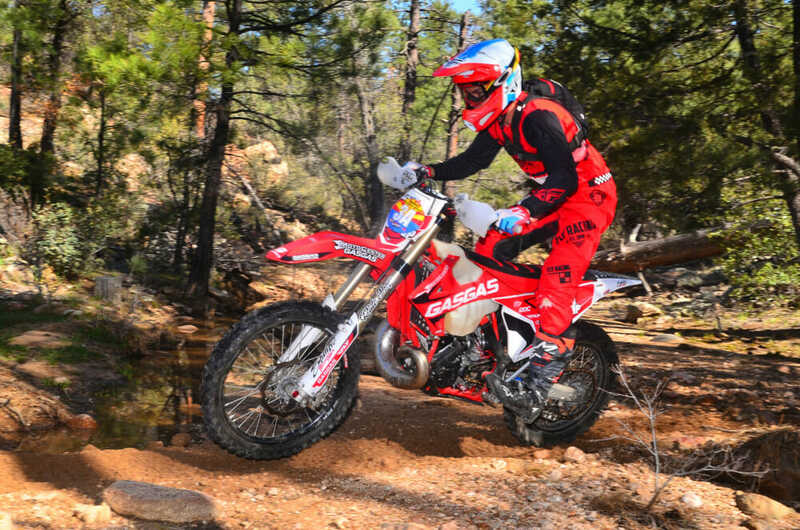 Next on the schedule is the Bill Holcomb Hare Scrambles in Page, Arizona on May 11. Visit AMRARacing.com for more information.